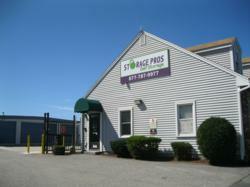 Storage Pros Management LLC (http://storageprosmanagement.com/), is pleased to announce the acquisition of Extra Space Storage of Fall River, a 76,250 rentable square foot self storage facility overlooking Interstate 195 in the southeastern Massachusetts city of Fall River. The acquisition brings Storage Pros’ holdings to 19 owned properties and 39 total properties under management comprising more than 2.2 million rentable square feet, including more than 19,000 storage units and outdoor parking spaces for rent. The property will be rebranded Storage Pros Self Storage, and is the 10th property under management in Storage Pros’ New England District. The Fall River property also represents the first acquisition by a newly-formed joint venture between Storage Pros and Virtus Real Estate Capital of Austin, Texas (http://virtusre.com/). The joint venture has two additional properties under contract and will continue to source properties for acquisition in shared target markets. The sponsors intend to invest in a substantial renovation and updating of the Fall River property. Debt financing for the transaction was provided by Eastern Bank of Boston, Massachusetts. For more information, please visit http://www.storageprosmanagement.com.